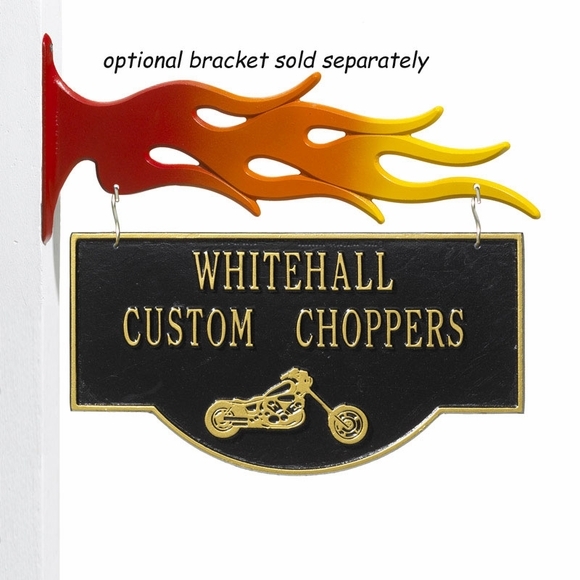 Personalized Hanging Garage Chopper Plaque - - 2 sided personalized sign for all chopper owners and fans. The same personalized text appears on both sides of the sign above a long, lean chopper. Line 1 holds up to seventeen 1.25" characters (including spaces). Line 2 holds up to seventeen 1.25" characters (including spaces). Color combinations: BG black with gold characters; BS black with silver characters; OG bronze with gold characters. Dimensions: 15.25"W x 9.25"H; weighs 5.1 pounds. Optional flame bracket sold separately (see Related Products) or hang from your own bracket.